"This is a very Portuguese recipe but I don't know it's exact name. Anyone make this at any time because you have all the ingredients already." Cover the bottom of an 8 inch square baking dish with half of the cooked rice. Spread the tuna mixture over the rice and cover with the remaining rice. 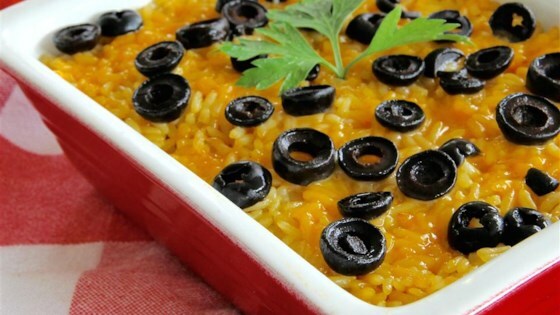 Sprinkle the olives and cheese over the top of the rice. Bake until the cheese melts and the casserole is heated through, 15 to 20 minutes. Nice way to use up stuff you already have. It could use a steamed vegetable in with the rice. I recommend broccoli or peas. this was okay, the flavor is not great but not bad. I did add peas which was a good addition but the flavor is lacking. I loved this recipe! I used brown rice instead of white and thought it was delicious! It is healthy, too!! Suprisingly good. Kids ate it. Added red peppers and green onions because that is what I had in the fridge. Would probably be good with any veggies. Great way to use up leftover rice too. I just made this recipe for our dinner and it was an instant hit. Very easy to make too! Thank You for sharing. This was good: I added peas and green onions to the rice. I also added an additional layer of black olives and cheese before adding the tuna mixture. I kept true to the recipe. It came out fine, I just found it to be too simple and bland. More rice than anything. This was pretty good. I left out the hot pepper sauce and added diced bell pepper. My kids ate it. My husband and I liked it as well.